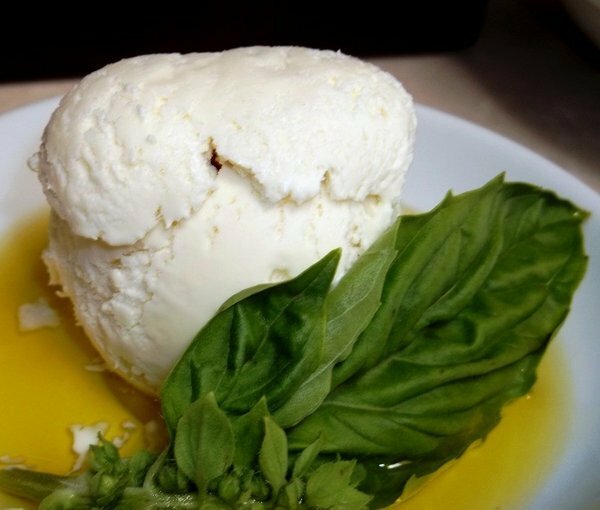 Here's the scoop: Try the basil olive oil ice cream. The flavors are off the charts: Basil Olive Oil, Rosemary Butterscotch, Strawberry Balsamic, Honey Lavender, Pepper Peach. Twenty-five different flavors in all. Where can you buy these salad dressings? You can’t because the above are all flavors of sweet and savory ice cream served by Artisan Ice Creamologist Leo Neveux at his shop on Melrose Avenue in West Los Angles. After picking up a pair of eyeglasses at L.A. Eyeworks, I wandered next door where fellow ice cream artisan Tim Fox made a few recommendations and served up a few delicious (deliriously good) samples. Each tasting came on a silver spoon. I tried several, but kept coming back to the Basil Olive Oil. It was incredible. 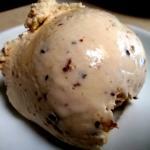 After enjoying it and a scoop of Strawberry Balsamic, I ordered, no lie, a pint of Maple Fig. How could I not! How could eating basil, strawberry vinaigrette and figs be anything but healthy! I coaxed Neveux out of his ice cream lair long enough to try to pry loose a few of his secrets. Once you open the door and try the ice cream, you'll never be the same again. At the time of his big life-changing decision, he was living near Bi-Rite Creamery and Bake Shop in San Francisco, a San Francisco foodie favorite well known for making artisan ice cream in small batches. Leo, whose first job was making baklava for a Greek restaurant when he was 13, thought he’d give the ice cream-making business a whirl. “I would take my ice cream to parties or poker games and people responded well to it,” he said. Then he took his recipes to Los Angeles, and went searching for a storefront to set up shop. “I looked at a lot of areas,” said Neveux, who has been open a year. “Landlords had not realized there was a major problem with the economy. I looked at places that are three times what I’m paying here.” Hence, he hoped he could pass off some of the savings to his customers. If you’re looking for bubblegum, fudge ripple, and other cloying creams at Leo’s shop, you’ve come to the wrong place, but if you’re seeking a tantalizing new experience for your taste buds, Neveux Artisan Creamery rocks. Although they may serve samples from a silver spoon, Leo and Tim are totally down to earth. They want you to hang out instead of trying to get you in-and-out. They want you to savor the savory. “When I was building the shop,” Neveux said, “I didn’t want it to be like every other ice cream place. The oak bar and wainscoting will attest to that vision. “I simply want people to enjoy the atmosphere, have a good time and stay as long as they like,” he added. Neveux also has a full espresso bar, and is planning to serve French-inspired meat pies and other goodies. Although Neveux is in the shop 15 or 16 hours a day, don’t expect any melt down from this tireless entrepreneur. Vinegar was never so delightful. His satisfaction from watching people enjoy a totally fresh and new tasting experience more than compensates for the long hours. The ice cream is that good! And besides, should he and Tim ever get sleepy, they can always pour themselves a fresh espresso from the back bar. 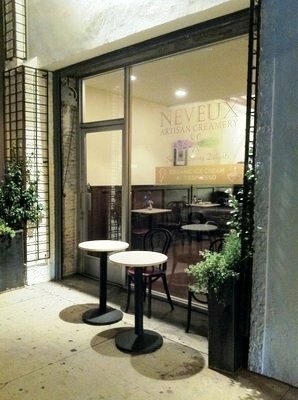 Neveux is at 7407 ½ Melrose Avenue in Los Angeles. 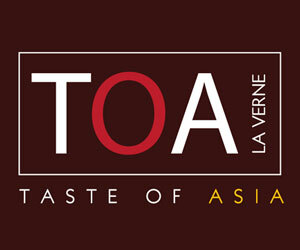 For more information, call (323) 951-1002 or go online at www.neveuxartisancreamery.com. For a great sweet and savory reading experience, visit www.HarvardReject.com, where you can find out more about one of the most motivational and inspirational books of our time. If you love books like The 7 Habits of Highly Effective People, See You at the Top, Think and Grow Rich and other classics, you will absolutely love Life Lessons of a Harvard Reject. Coming out the week of September 24-28, 2012.